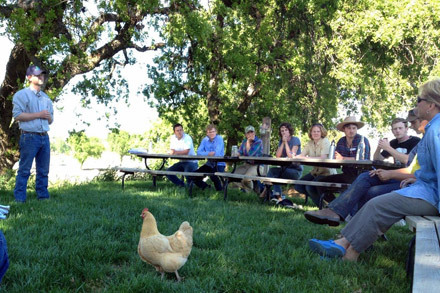 To help meet this need, the Center for Land-Based Learning in Winters recently launched the California Farm Academy (CFA) to train beginning farmers in specialty crop production. The six-month incubator program is designed to help aspiring agriculturists transition quickly into starting their own farms. Unlike many programs and apprenticeships that require students to participate full-time or live on a farm, the CFA meets on evenings and Saturdays to accommodate the busy schedules of people who currently work at non-farming jobs. Academy students spend time in the classroom as well as in the field, greenhouse, and packing shed. To provide perspectives from the frontlines, the CFA has teamed up with local farms such as Ferry Plaza seller Capay Organic, which also markets produce through its Farm Fresh to You CSA and Ferry Building store. 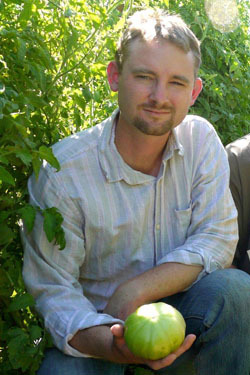 Second-generation farmer Thaddeus Barsotti (pictured below)i, co-owner of Capay Organic with his brother Freeman, volunteers as a teacher for the Academy, and the farm serves as a site for classes and demonstrations. For their final project, students will use their new knowledge to develop business plans that they will present to a panel of farmers and lenders prior to graduation. 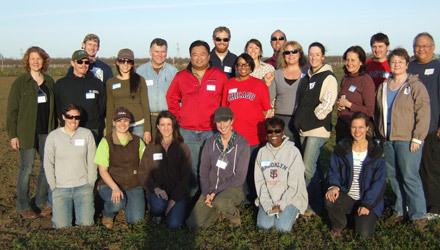 Similar to the farm training and incubator program at Agriculture and Land-Based Training Association (ALBA), the Academy will provide support to graduates after their initial six-month program by offering them the opportunity to lease land at the Center for Land-Based Learning and at Russell Ranch, located at the University of California at Davis. They can lease ¼- to ½-acre plots at half the market rate for up to three years. Photos courtesy of Capay Organic/Farm Fresh to You.